Though numerous militias exist on the regime side in Syria, only a few have garnered wider media attention. The most notable of these few groups is of course the National Defence Forces (NDF), set up as a counter-insurgency and auxiliary holding force in late 2012 with help from Hezbollah and Iran. The NDF has centres throughout the Syrian provinces where the regime still maintains a viable presence and remains an important force. Another group that garnered attention was the Coastal Shield Brigade (Liwa Dir' al-Sahel), set up in 2015 as the regime experienced substantial losses in Idlib province and the Homs desert to the rebels and the Islamic State (IS) respectively. The 'shield' aspect reflected a broader shift in the strategic thinking at the time, in which the emphasis shifted to defending vital areas amid exacerbating manpower problems. "In response to the rapid developments for events, to reinforce the successes of the intrepid armed forces and heeding the desire of our defiant people to put an end to the terrorist acts upon the lands of the Syrian Arab Republic, the General Command for the Army announces the formation of the Fifth Legion- Assault, from volunteers, with the mission of destroying terrorism alongside the rest of the formations of our heroic armed forces and the auxiliary and allied forces to restore security and stability to all the lands of the Syrian Arab Republic. The General Command for the Army and the Armed Forces calls on all citizens who desire to participate in realizing the final victory over terrorism to go to the reception centres in the provinces." – Damascus: Southern Regional Command-Damascus Area Command-10th Division Command Qatana. – Homs: Central Regional Command. – Hama: Hama Area Command-Administrative Affairs College in Masyaf. – Aleppo: Northern Regional Command. – Tartous: Tartous Area Command. – Latakia: Coastal Regional Command. – Deraa: 5th Division Command. – Suwayda': 15th Division Command-Special Forces. – Must be at least 18 years old and not obliged for compulsory military service (khidmat al-'alam) and has not deserted from compulsory service. Eligible for acceptance are state employees and those who have completed their compulsory military service from all classes, including officers, non-commissioned officers and ordinary personnel. Their enlistment will be according to a contract of one year subject to renewal through appropriate agreement. State employees in particular who enlist are entitled to claim a salary from the Fifth Legion while maintaining the salaries and benefits of their existing jobs. From the conditions for recruitment outlined above, the most important point to note is the contrast with many of the militias that try to recruit through offering an amnesty for those who have avoided and deserted compulsory military service. In addition, the terms for state employees seems to suggest that the army is trying to tap into this demographic in particular as a potential source of manpower for the Fifth Legion. The emphasis on a definitive victory over 'terrorism' also points to the regime's calculus at this point: namely, that it is on the road to decisive victory, eventually entailing the retaking of all of Syria. It should be noted that a formation similar to the Fifth Legion was announced last year as the overt Russian intervention in the form of airstrikes was getting underway. That formation was called al-Faylaq al-Rabi'- Iqtiham ("The Fourth Legion- Assault"). This force was said to have been formed from Syrian soldiers and volunteers with Russian specialists, in addition to a joint Russian-Syrian command. Its first operations were due to take place in the Idlib, Hama and Latakia countrysides. Subsequent evidence quickly emerged of engagements on the ground. 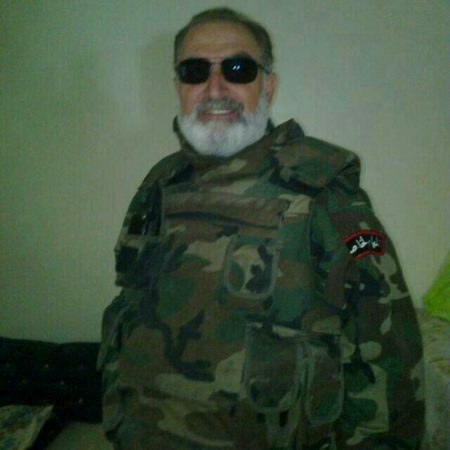 For example, in early November 2015, a 'martyr' for the Fourth Legion was claimed in one Rami Marwan al-Khouli, originally from the Homs province town of al-Qusayr near the Lebanese border and killed in fighting in Latakia province. Another individual presented as a Fourth Legion 'martyr' at the time by at least one account was Mohsen Afifa, also killed in the Latakia fighting. The Fourth Legion appears to have endured as a formation, with references to the contingent's existence, its operations and slain fighters occurring throughout 2016, primarily on the Latakia front. In fact, in July 2016, the General Command for the Syrian army reportedly changed the leader of the Fourth Legion (Shuqi Yusuf) on account of repeated errors and false assessments of the battle, leading to substantial setbacks especially on the Kanasba front in Latakia at the time. Below are some more photos of slain fighters from the Fourth Legion. Memdouh Ken'an, originally from al-Qardaha. Killed on the Latakia front. He was apparently a veteran of campaigns in Deraa and the Hawran area. At least one account also has him as being a part of the Syrian army's 5th Mechanized Division. Mahmoud Ahmad al-Ahmad, originally from al-Hamdaniya in Aleppo. 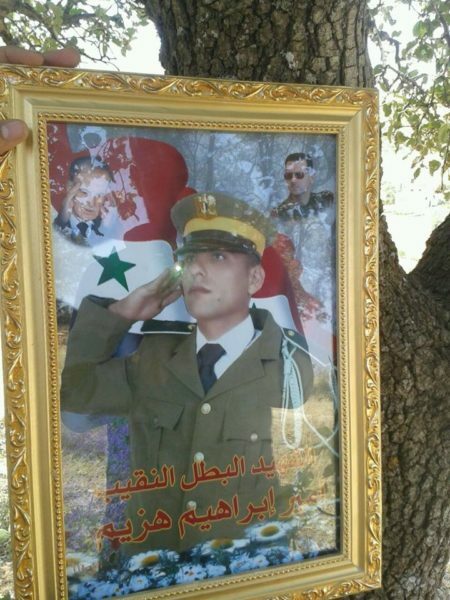 Killed in fighting in Latakia province. Abd al-Hameed Hilal al-Daman, originally from Himo Hanadi in Hasakah province. Killed in fighting in Latakia province. Amir Ibrahim Hazim, originally from al-Salukiya of the Masyaf area. Killed in Kanasba area, Latakia province. The issue of mistakes in the field, as illustrated partly in the experiences of the Fourth Legion, is touched upon in an article in the pro-Assad Lebanese newspaper al-Safir regarding the formation of the Fifth Legion. Specifically, the article says that some mistakes and insufficient levels of coordination were revealed in the field and battle experiences since the time of the Russian intervention and the formation of the Fourth Legion. These mistakes are said to have been looked at by the concerned parties, with an aim to resolving them, paving the way for the entry of the Fifth Legion into the battlefield. The newspaper further claims that the foundational force for the Fifth Legion will be a mixture of existing combat groups that have acquired high-level experience, alongside new recruits or former fighters from the NDF branches. According to the article, forces of Suqur al-Sahara' (a private elite militia) and Liwa al-Quds (a Palestinian-Syrian militia from the Aleppo area that played an important role in the recent retaking of east Aleppo) are expected to be the tip of the spear and strike force of the volunteers. In addition, the newspaper says it is expected that some of the military command of Hezbollah will play a foundational role in leading groups of the fighters that will join the Fifth Legion, and that some elite forces of Hezbollah will operate either under the Fifth Legion's banner or in operational coordination with it. 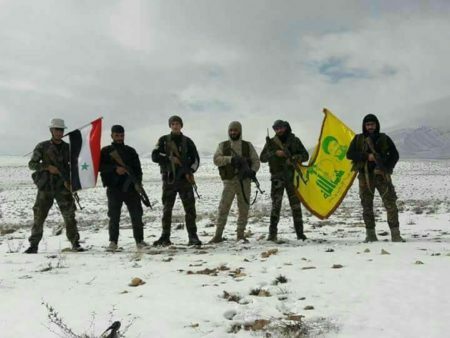 Some commentary has focused on this suggested Hezbollah involvement in the Fifth Legion as a key development of "official integration" pointing to a future trend of Iranian-backed militias being granted legal cover in Iraq and Syria. Leaving aside the Iraqi aspect of the situation with regards to integrating the Hashd Sha'abi units (partly driven by PM Hayder al-Abadi's desire to exert stronger control over the militias), this interpretation seems to be an over-reading of the available information on the Fifth Legion that also overlooks the fact that Iranian-backed militias are already using the legal cover of the Syrian state in certain ways, such as the Iraqi group Liwa Dhu al-Fiqar under the Dir' al-Watan conglomeration of the al-Bustan Association, Liwa al-Imam al-Hussein overlapping with the 4th Armoured Division, and some Hezbollah personnel operating under the NDF. In any case, characterizing the Fifth Legion as an "elite" part of the Syrian army is premature. Properly speaking, the Fifth Legion defines itself as affiliated with al-quwat al-sadiqa ("forces of friends"). To be sure, it is a slightly ambiguous term. On one reading, it can be seen as synonymous with Quwat al-Asdiqa'. This means a function as a formal auxiliary force of some sort for the Syrian army, and one should compare this designation with the case of Quwat al-Ghadab, a Christian militia in the Suqaylabiyah area of Hama province. In initial reporting, the pro-regime outlet Damascus Now wrote that the Fifth Legion will get its training, equipment and salaries from the Asdiqa' ("The Friends"), though it did not specify further what it meant by this term. An alternative way to read al-quwat al-sadiqa is to look at other occasions on which the term has been used: it often refers to the regime's foreign allies and their forces assisting the Syrian army on the ground (e.g. the Iraqi militia Harakat al-Nujaba' and the Russian forces). If al-Safir's unconfirmed information on integrating forces from a variety of militias into the Fifth Legion is correct, a motivation clearer than just officially integrating Hezbollah into the Syrian state's armed forces appears to be improving operational abilities through overcoming rivalries and competition for influence that have emerged between various forces on the regime side and sometimes impeded effective coordination. This is of course suggested in the newspaper's article. "Messages are reaching us condemning the frequency of text messages that announce the Fifth Legion and call on the citizen brothers to join its ranks. We will say in simple words: 'We apologize for annoying you, for we are working for your sake.'" "Leadership from the officers of the Fifth Legion- Assault is participating in the preparation for the battle to recover the city of Palmyra from the Da'esh terrorist organization, and information about the possibility of ruling out one of the auxiliary forces that was a reason for what happened when the city fell." The latter part of that statement is particularly interesting. While the regime was focusing its efforts on Aleppo, the Palmyra front was manned by a number of militias, but they appear to have put on a pretty dismal performance in trying to defend the city from IS. These militias on the Palmyra front included Syrian Hezbollah groups like al-Ghalibun, Liwa al-Imam al-Mahdi and Quwat al-Ridha. In particular, the IS offensive on Palmyra was the first major engagement on the Palmyra front for Liwa al-Imam al-Mahdi and appears to have been set as an emergency assignment for al-Ghalibun. 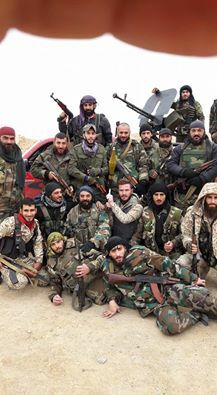 The Afghan Shi'a unit affiliated with the Iranian Revolutionary Guard Corps (IRGC)- Liwa Fatemiyoun– has also had a presence in Palmyra, with four special contingents stationed there as part of a long-standing line of defence against IS, according to a Fatemiyoun commander quoted by IRGC news outlet Tasnim News. Since the fall of the city, the regime has called up additional forces like the Syrian army's 10th division, the NDF branch Fawj al-Jowlan and the Qalamoun Shield Forces as IS has also threatened the important T4 airbase. 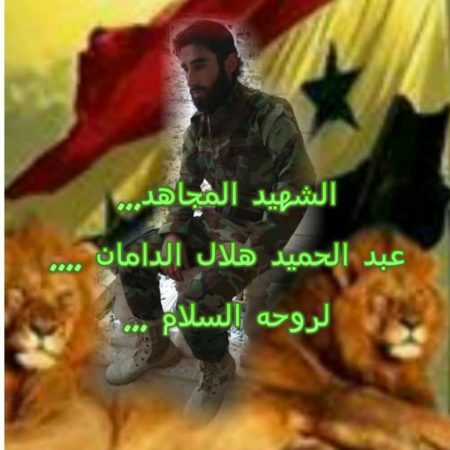 Abu Hayder al-Harbi, an Iraqi member of Hezbollah's forces in Syria, further told me that Hezbollah and the IRGC are currently fighting on the Palmyra front. Quwat al-Ridha and the Syrian army on the Palmyra front. December 2016. Fawj Nusur Homs, another militia (air-intelligence affiliated) on the Palmyra front. 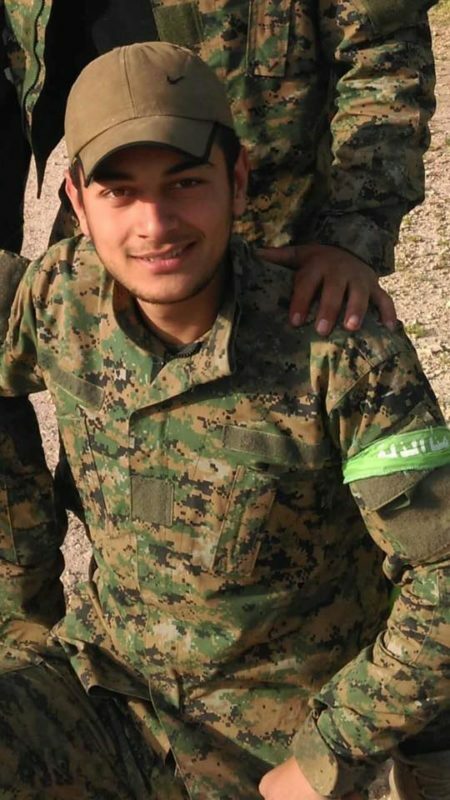 Samer Kurdi, a Hezbollah fighter from the Idlib Shi'i village of al-Fu'a, recently killed on the Palmyra front. How far the Fifth Legion will come to play a real and important role in the battlefield remains to be seen. The provincial governor of Latakia- Ibrahim Khidr al-Salim- seems particularly keen to have people enlist in the Fifth Legion, involving state administrative bodies in the process. He has even reportedly directed Latakia institutions and foundations to cancel work contracts of male workers in Latakia between 18 and 50 years old from other provinces if they do not join the Fifth Legion. This ultimatum is not to be applied if the worker has been exempted from the Syrian army for reasons such as health. 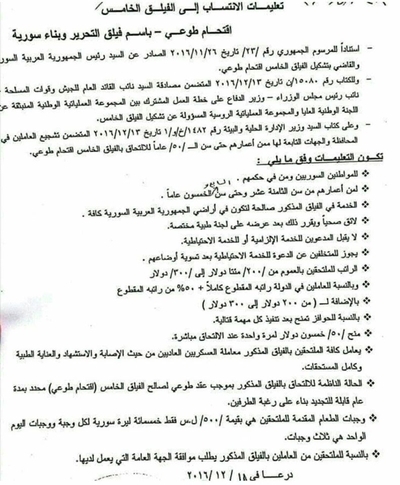 The authenticity of documents circulated with regards to this matter appears to have been subsequently confirmed by postings such as this one on teachers in Latakia joining the Fifth Legion. This may indicate that recruitment efforts into the Fifth Legion have not been as successful as the regime might have hoped. Indeed, it is possible the Fifth Legion will end up going the way of Liwa Dir' al-Sahel: much hype initially but then fading into obscurity and becoming of little or no operational significance. In any case, there is no doubt of the ongoing manpower problems facing the regime, despite the confident offensive-minded mentality in light of the Aleppo victory. "Breaking: the Secretary of the Supreme Council for Iranian National Security Admiral Ali Shamkhani [cf. here] arrives in Damascus and at the head of his activities is discussing the formation of the Fifth Legion that will be with support from the friends [al-asdiqa'], especially Iran."
. For Syrian citizens and whoso is subject to them.
. Service in the aforementioned [fifth] legion is suitable to be in all the lands of the Syrian Arab Republic.
. In good health, with that proven after being subjected to a special medical committee.
. Those called up for obligatory or reserve service are not to be accepted.
. It is allowed for those who refrained from reserve service to be accepted after sorting out their affairs.
. The salary for those who join in general will be $200-300.
. For employees in the state: fixed-term salary in full+50% of the fixed-term salary, in addition to $200-300.
. As for benefits, they are granted after executing every combat assignment.
. Granting of $50 one time on joining directly.
. All those joining the aforementioned legion will be dealt with as ordinary military personnel in the realm of being wounded, martyrdom, medical care and all entitlements.
. The organizing basis for joining the aforementioned legion will be according to a voluntary contract for the interest of the Fifth Legion (assault- voluntary) defined for a period of a year subject for renewal according to the wish of both parties.
. Meals of food offered for those who join will be at value of 500 Syrian pounds only per meal, with three meals per day.
. For those workers who join the aforementioned legion, the common agreement of the party he works with will be requested. 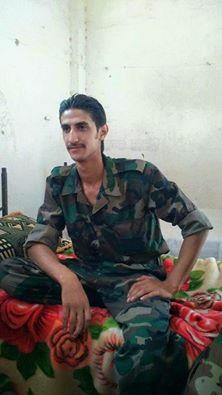 "The fighters of the Fifth Legion are distinguished from their counterparts from the fighters of the Syrian army and auxiliary units [wahdat radifa] through the distinction of fighting on a completely voluntary basis without the existence of any conditions forcing the fighters to join the ranks of the legion. Likewise the fighters of the legion are to be considered among the fighters with the most competency and combat experience acquired over the years of the crisis in Syria. Likewise the standards of selection of the fighters that can be summarised in individual advantages with the one fighter have made its fighters the creme de la creme. It is expected that the forces of the Fifth Legion will impose its new methods in the battles and their results will appear in the year 2017, especially as the Fifth Legion receives support and administration in their entirety from the states that are friends of Syria [i.e. Russia and Iran] through the Syrian Ministry of Defence." "We reaffirm that the Fifth Legion is affiliated in its support and relations directly with the quwat sadiqa." (Update 6 May 2017): For more on the idea of Quwat al-Asdiqa' referenced in this piece, see here.